North Cyprus has a wealth of Festivals throughout the year and as Spring approaches we can enjoy the festivals celebrating the many flowers which are appearing at this time of year. 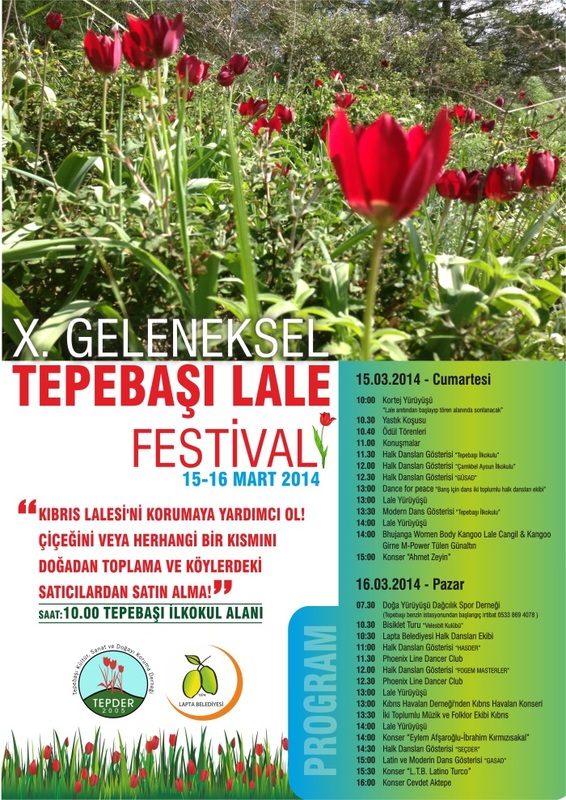 One of these will be the 10th Tepebaşı Tulip Festival which is to be held on Saturday and Sunday 15th and 16th March. This event started in 2005 and has become very popular not only with the Cypriot community but also the expatriates who have made their home in North Cyprus. The event will start at 10am and there will be lots to do and see with stalls selling local produce and many forms of entertainment throughout each day. On the Sunday there will be a performance by the Phoenix Line Dance Group and this type of dance is very popular with the expatriates and it seems to also be very well received by the Cypriot community. The weather is starting to improve so by the time of the Festival we should be assured of some nice weather to enjoy a day out in the sun. If you have not been to this village festival then you should, even if it is just to see the fields of Tulips. They are not in the village but you are led to the area where you leave your car and I think it was about an hour of gentle walking in a circular route. These Tulips are unique to Cyprus. Remember that the Tulip fields of Holland originated in Turkey. On the walk you will also see several varieties of rare flowers which you can add to your photo collection. Thank you David for your comments and the additional information which we will publish for you shortly.